Wine and painting classes are one of the latest trends to hit Kansas City. They are a fun way to celebrate a birthday, bachelorette party, corporate teambuilding, baby showers, girls’ night out, date night, or just an excuse to release your creative side. There are few wine and paint studios throughout Kansas City, which makes it easy to find one that’s near you. Several of the studio's listed offer alcohol at the event, but not all of them. If you don’t have to bring alcohol, the only other things you should be prepared to bring to a wine and painting class is close that you don’t mind getting paint on and a sense of creativity and humor in order to make your painting the best it can be. Most classes range from $35-$40 per person, which includes the canvas and all painting supplies. Most classes take about two hours. Most paint classes are catered towards beginners, but a few studios do offer classes that are geared towards intermediate painters. That being said it’s not imperative to have any artistic ability in order to have a fun time at the class. Hours: open seven days per week; check the calendar for availability and open class dates. About: Grapes and Paints was founded in 2012 and is Johnson County’s first BYOB painting studio. Classes are offered for adults and children. While glasses and bottle openers are offered in this class, adults must bring your own alcohol, as none is offered for sale in the studio. Hours: classes are offered every afternoon and evening except for Mondays. Some times it may be booked for private parties. 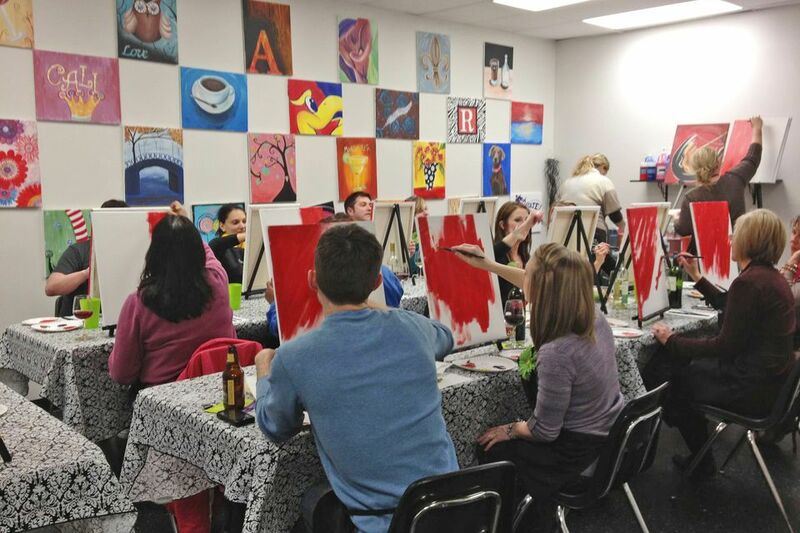 About: Thirsty Palette is near Leawood and offers space for 10 to 30 painters at once. Their website offers online booking for open classes, as well as a space to inquire reserve private class times. They tout their fully-stocked bar, beyond only wine. You are guided by the artist who created the painting and even those with no painting experience can enjoy and create a work of art. They welcome baby showers, bachelorette parties, birthday parties, and corporate team-building events for private events. Hours: Open classes vary weekly, but usually they are closed on Monday. Pinot’s Palette allows you to BYOB, but a bar is also available, offering wine, beer, and snacks. Water is provided free of charge, but other drinks and snacks can also be brought in by class participants. They provide a large ice bucket to chill your wine during class. They have some kid's specific classes, while the usual public classes are open to those age 13-17 with an adult, as well as anyone over age 18.